There is much to appreciate in this week's lesson. James 3:1-12 is a worthwhile warning to us all. My criticism is not that I disagree with James, but that Adventist belief cannot let go of behaviorism. This opening passage is indicative. It is posited as the theme verse for the entire week. Its clear message is that justification and condemnation are directly related to the words we speak. What is the context of Matthew 12:37? Please open your Bible and look. The chapter starts with a multi-part verbal battle between Jesus and the Jewish leadership regarding Sabbath observance. That degenerates into the leadership accusing him of casting out demons by the prince of demons. Jesus replies by defining the unpardonable sin. Only then does Jesus warn them that their own words, “This man casts out demons only by Beelzebul the ruler of the demons” (Matthew 12:24 NASB), will be the source and proof of their condemnation. Even after Jesus' direct warning they ask him for a sign. Jesus replies with the sign of Jonah, using it to demonstrate his upcoming resurrection. In short, Jewish leadership quite literally is hell-bent on rejecting Jesus, the only one who can save them. Can this apply to us? Certainly! But the kind of speech to which the lesson refers hardly rises to the level of blasphemy of the Holy Spirit. Do you really believe that if you curse when you pound your finger with a hammer or tell a bald-faced lie to your spouse you will lose your salvation? Do you really believe that repenting, confessing and asking forgiveness for such actions causes God to return your salvation? The lesson does a nice job of explaining the temporal consequences of a careless tongue, but those consequences do not include eternal damnation. As explained many, many times by the various authors of these commentaries, you either are saved or you're not. Before you are saved, everything you do is sinful – even, and perhaps especially, the good things – because, as the lesson points out, a bad tree cannot produce good fruit. Your behavior simply cannot cause your salvation. What drives behaviorists crazy, however, is the mirror thought: That after salvation your behavior cannot cause your condemnation. I am not saying that a saved person never sins. Anything that doesn't flow from faith is sin (Romans 14:23), and all saved people wrestle with faith the rest of their lives after the moment of salvation. This is caused by the “flesh”, or indwelling sin, that we're left with, even after salvation, and will have until Jesus returns and transforms our old bodies into new, spiritual bodies (See 1 Corinthians 15). It is important to keep these facts in mind as you read the lesson. Again, this lesson has much to offer by way of describing the problem and introducing the solution. It's just that the solution introduced is always short-changed by an appeal to do better. I really like the author's pun: “This week, as we will see, James has some important words about, well, words.” It is a really good introduction to a problem that afflicts all of us. I co-host a live, Biblical counseling program Monday through Friday that airs on several radio stations around the country and via a live web stream around the world. We are acutely aware of the power of our words. We constantly remind ourselves that everything we say must point people to Jesus. We make mistakes. And we realize that even an apology for those mistakes can't erase the confusion and/or pain they caused. The same is true for these commentaries. My constant goal is to raise up the all-sufficient Jesus as our only hope. When I criticize a Seventh-day Adventist theological position I must do so seriously and carefully. It does no good to bludgeon someone, but I must be direct. Yes, I realize my accountability to God for my words. And I thank him often for his patience with me and his ongoing forgiveness of me. You may not have the platform I have, but you've been a child, student or newbie on the job. Most of you have been parents. All of us know the joy and heartache of words, those spoken to us and by us. Please don't allow your failure to speak lovingly and clearly at all times drive you to doubt your acceptance or the forgiveness that is yours in Christ. Jesus' sacrifice and resurrection and the gift of the Holy Spirit prove that he never will leave us or forsake us. They also prove that he will continually renew our minds as we learn how to talk all over again. Monday's lesson is a powerful reminder that our words matter. Especially good is the author's description of the danger of allowing “thus saith science” to supersede God's word. There are many things science cannot know, but which are revealed to us by the Spirit. To make James the patron saint of behavior is unfair. 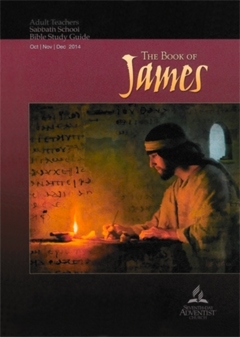 James was dealing with people who fully believed that their ethnicity and history guaranteed them a place as God's special beings. They were cut from different cloth. They were superior. Yes, many of them had accepted Jesus and were born-again saints, but they still carried this arrogance. They tended to sit around doing nothing, except criticizing everything and everyone not them. James is calling them to reality. He invites them to stop talking a good game, and start playing the game. In this sense he does show them many ways by which they can judge their own behaviors as real or fake. Real and fake are not good and bad actions. Rather, the words represent the contrast between “by faith” and “by works.” They are the result of Christ living through you vs. you doing the “right” thing in your own strength. In all of this no one else can judge your behavior. At best, you ask the indwelling Spirit to reveal your tendency to take control so that you can begin to walk by faith. Only when we see it this way can we understand what James means by “perfect.” This kind of perfection is impossible, unless inspired, prompted and accomplished by the Spirit working through us. I think the lesson hints at this, but doesn't say it strongly enough. There is amazing power in words for good and ill. The author describes this very well. But the even more amazing power of the Holy Spirit to bring about the perfection/completion we desire is not emphasized as it could be. Again, the problem statement is well put. I think it would have been helpful to turn the bit and rudder examples to the positive. This is where Galatians 5 fits in. Yes, our tongues, though physically small, can cause much pain. But in the battle between the flesh and the Spirit something as “small” as the Spirit's influence literally can turn us from loss to gain. This is the key to controlling the tongue. I do not control my tongue in my own strength, gifts, talents, education or anything else. I control my tongue only so far as I allow the Spirit to control me. I really like the author's reference to the story of the village that rejected Jesus. What made Jesus able to give a “soft” answer instead of succumbing to the disciples' indignation? He relied completely on the Father to do and say everything. Actually, the Bible says that Satan tempted Adam and Eve with the idea of being “like God.” Later, God gives the Babylonian captives a taunt to use against the king, telling him that though he is a “star of morning” who said, “I will ascend to heaven,” he will be crushed (see Isaiah 14:1-22). The meaning of this passage often is extended to apply to Lucifer. Revelation tells us that there was war in heaven, and that Satan was cast down. None of these passages refer to “laws that governed heavenly beings.” Therefore, the quote, by Mrs. White, gets in the way of an otherwise good point. Our tongues light fires all around us because our first inclination at the slightest real or perceived provocation is to claim God's prerogatives, and then try to lay waste everyone around us. Refer back to the unbelieving Samaritan city example in yesterday's lesson. This verbiage from the pit of hell is not a rejection of Law, but a rejection of Jesus. This point can't be made strongly enough. When we base our behavior in Law, our failures inevitably lead us to water down the Law and invent loopholes regarding why what we did is okay. You've done it. I've done it. On the other hand, when we see our lack of control in terms of trying to take control from God, then there is no way to explain it away or water it down. We simply must admit it for what it is. This is why only grace, the indwelling Spirit empowering us to be who we've been called to be and to do what we've been called to do (see Philippians 1:6 and 2:12, 13), can teach us to say No to ungodliness (see Titus 2). This is why living in the once and for all forgiveness provided by Jesus' death is the sole prerequisite to living the eternal life he rose from the dead to give us. Put in this context, we don't do damage control. We confess to one another and we forgive each other as we've been forgiven. Both of these are prompted and enabled by the Holy Spirit. We also realize that broken eggs are broken eggs. We can't put them back together. Sometimes human relationships are broken, but even then our relationship with Jesus never is broken. I think the lesson's author has made this point quite well, but the constant appeal to do better and try harder that is Adventism's solution to everything results only in superficial change and a life-time of regret. Please don't misunderstand. Every religious belief system does the same thing. Baptists, Methodists, Episcopalians, Catholics, and so on take this same do-better-try-harder approach. Wednesday's lesson provides an excellent description of the cost of careless words. But a careless appeal to Ellen White's insistence on Law as the core belief ruins any chance for real change. It does little good to recognize a problem if the solution offered is no solution at all. I repeat what I've already written. A good problem statement is wasted by a poor solution. I've quoted the solution offered in this lesson above. How many of your sins were in the future when Jesus died for them? There is only one possible answer. ALL of your sins were in the future when Jesus died for them! When you accept Jesus and are born again, what is one of the things you receive at that moment? If you belong to Christ, you are a forgiven person. It is a fact. It is not something for which you need to plead. It is not something you lose when you're bad and hope to regain if you're good enough. Forgiveness is the bedrock upon which your salvation stands. Jesus solved the sin problem once and for all when he laid down his life. There is no more forgiveness to be given, because there is no more sacrifice for sin to be offered. See Hebrews 10:1-18. It is finished! Constantly driving people back to their knees to ask for forgiveness is a repudiation of what Jesus accomplished once and for all. It is unbelief. It is denying Jesus, and as we saw earlier, such denial is the unpardonable sin. Some people never have accepted the real Jesus. They are lost, regardless of their behavioral facade. Others have accepted the real Jesus, but live in confusion due to incorrect teaching. This confusion results in a completely unproductive life. The solution is the same for both groups. Step 1: Accept the forgiveness Jesus provided at the cross. Step 2: Move past the cross to the empty tomb and accept the eternal life provided there. In other words, accept the gospel that saves (1 Corinthians 15: 1ff). The truth of the gospel, the living Christ working in and through us by his Holy Spirit, is the only solution to a mouth that speaks both blessings and curses. This is because the gospel, and the gospel alone, gives us the power to focus solely on Jesus. Everything else results in double-mindedness and instability. This part of the lesson is the week's most blatantly legalistic explanation. It misses Christ's finished work completely, and that can result only in a be-more-do-more behavioral attempt to create what only the indwelling Spirit can create. Such self-based attempts are doomed to failure. By contrast, accepting your status as a forgiven person provides the only foundation on which the living Jesus can build your new life in him. This is the only way real change, that is, change from the inside out, can occur. Actually, there is truth in the quotation, though it, too, prescribes a behavioral approach. However, the appeal to “the mind and heart... full of the love of God” is very meaningful. But here's the problem. Most Adventists believe the statement is true because Mrs. White said it, and Mrs. White always has the last word. This is nothing less than idolatry. The fact is, a statement is true because it is true, not because any particular person said it. I live in the Dallas-Fort Worth area where more super churches exist than anywhere else in the country. I'm talking about churches of 20,000 members and more. These churches are led by superstar pastors, and you often hear people say, “Well, Pastor Jeffress [or Pastor Graham or some other lead pastor] says, ...” Most of these pastors are horrified by this idolatry, and they constantly wrestle against it by putting things in the proper perspective. There are other pastors who feed off the idolatry. Even though Adventists are no different in this regard than other churches, they are one of very few denominations who have codified their idolatry. Such is Belief #18. The highlighted statement directly echoes 2 Timothy 3:16, 17, which is used in Belief #1 regarding the Bible. Beliefs 1 and 18 cannot both be true at the same time. That Mrs. White is a “continuing and authoritative source of truth...” is a death knell to any claim of Biblical authority: the sola scriptura so many died for during the Reformation. The final statement ("…the Bible is the standard…") simply is ignored by those who quote her the most, including every quarterly lesson I've reviewed over the past six years. I believe that as long as the Seventh-day Adventist church maintains this idolatrous position they will be unable to accept the grace so freely offered in Jesus. To be sure, individual Adventists do not idolize Ellen White, choosing instead to fix their eyes on Jesus alone. These folks are experiencing grace every moment of their lives. They are learning how to walk by faith, and how to give the Spirit control, even over that most troublesome bit of anatomy – the tongue. There is a clear choice to be made: Accept Jesus and become a new creation who lives by grace through faith, or do-more-be-more-try-harder on your own. The first is the way of the Bible. The second is the way of behaviorism. The first is guaranteed to result in an abundant life as you joyfully participate in the divine nature as you are changed from the inside out. The second is guaranteed to result in a life of heartache and shame as you desperately try to cover your nakedness with efforts you know down deep cannot possibly succeed.